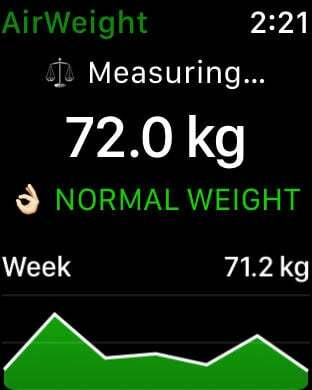 AirWeight connects to your SANITAS SBF70 or Xiaomi Mi Scale 2 Bluetooth LE scale and reads your weight in realtime, calculates your Body Mass Index and saves it to HealthKit. 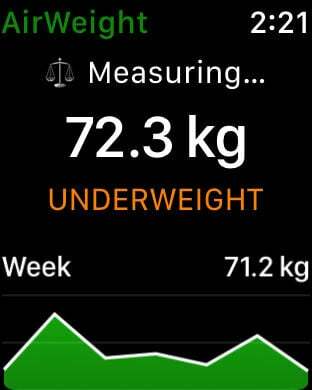 AirWeight can write your weight readings and BMI to the Health app. To calculate the BMI you should allow AirWeight to read your height data from the Health app. You can add your height directly in the Health app. Due to system limitations, Apple Watch support is limited to Series 2 or higher. Support for other Bluetooth Weight Scales may be added in a future update. Requests are welcomed at @pvieito.